Posted June 10, 2014 by & filed under sidebar-primary. This versatile swing back seat locker allows you to face either forward or aft – ideal for the center console or cuddy cabin boat. Only 36 in. wide – it fits the average 17 to 24 footer. .Features include all polyethylene construction, four large divided drawers behind lockable water tight doors as well as accommodating up to a 94 quart cooler underneath. This ultimate space saver combines efficient drawer storage with a cushioned leaning post and easily accommodates your large cooler. This maintenance free locker is constructed from solid polyetelene. We use stainless steel hinges and hardware. This locker comes standard with four drawers. 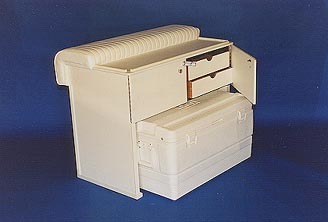 This new design combines the best features of our tray rocket launcher and our tackle storage lockers. 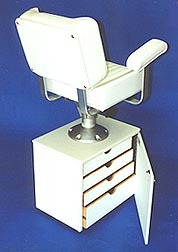 It’s designed for center cockpit installation with a deck footprint of only 24″ x 12″ and topping out at 34 in. high. Constructed of maintenance free polyethylene, it comes standard with five large drawers with a lockable door and four stainless steel rod holders. This locker features 4 large drawers for maximum storage as well as our new swing back contoured seat. It mounts easily to any deck surface. 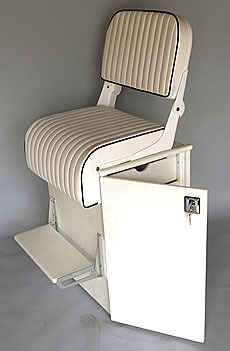 This seat locker features our popular captain’s seat with slide and swivel. 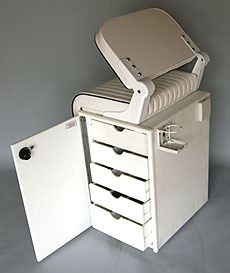 The locker provides four large drawers with removable dividers. 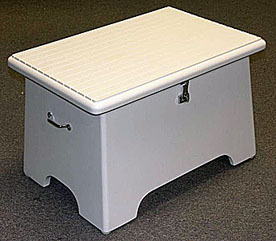 You may order this locker with our pedestal mount only and use your existing helm seat. You’ll save space and have plenty of storage with this compact cabinet which contains six drawers with dividers. It features maintenance free polyethylene construction. Our mini drawer locker is small enough to be placed behind the bridge ladder on the average sport fisherman boat or trawler yacht. This locker mounts securely to any deck surface. These nifty lockers utilize any unused space on your boat. Built to your specifications. Pictured are two different styles of many that we have built.